Brand New Genuine Ametek Lamb 3-Stage 7.2 Vacuum Motor. Replaces the following part numbers : 116119, 116119-00, 116119-01, 116103, 116103-00, 116103-01. Fits many Central Vacuum units. Be sure the dimensions of your motor or motor housing area match or accommodate these dimensions. UL Recognized (E47185), CSA Certified (LR31393). I OWN A VACUUM STORE / REPAIR SHOP. IF YOU HAVE OTHER VACUUM RELATED NEEDS, PLEASE LET ME KNOW, AND I WILL DO MY BEST TO HELP YOU! 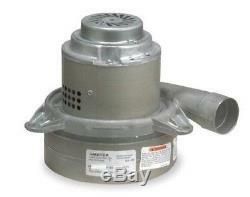 The item "New Ametek Lamb 3-Stage 7.2 Vacuum Motor 116119-00" is in sale since Monday, March 31, 2014. This item is in the category "Home & Garden\Household Supplies & Cleaning\Vacuum Parts & Accessories".